Tuesday July 6th 1909 Mr Merrifield came out today and painted a strip about all the rooms and the porch ceilings. I was busy with the work all forenoon and washed windows all afternoon. It rained all day long. Wednesday July 7th 1909 There was a show in town and Will went in before noon and as he had other things to see to went back after dinner. I was busy with the work and in the afternoon wrote a letter to Lizzie Lindley and was down to the store awhile. 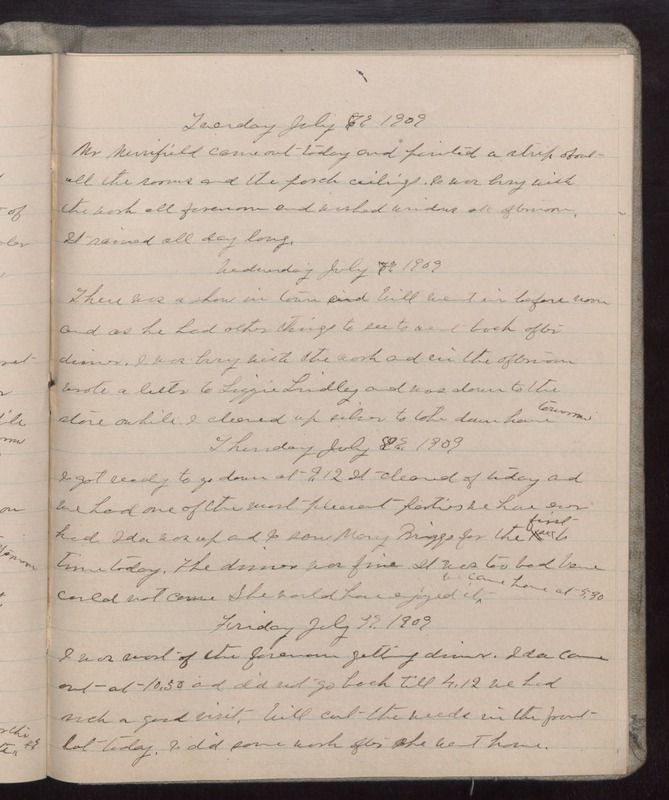 I cleared up silver to take down home tomorrow Thursday July 8th 1909 I got ready to go down at 9.12 It cleared of today and we had one of the most pleasant parties we have ever had Ida was up and I saw Mary Briggs for the first time today. The dinner was fine. It was too bad [Verne?] could not come. She would have enjoyed it we came home at 5.30 Friday July 9th 1909 I was most of the forenoon getting dinner. Ida came out at 10.50 and did not go back till 4.12 we had such a good visit. Will cut the weeds in the front lot today. I did some work after she went home.